I had some sort of an idea for a post when I took this picture, but I can’t remember it now. 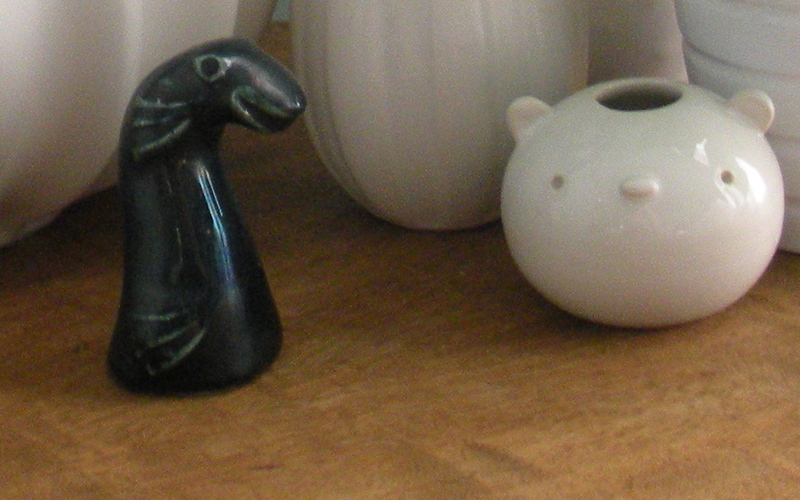 What did I want to say about this porcelain bear head and this earthenware sea monster head? That curious little green fellow came from a Madison estate sale—for some reason, much rarer here than in suburban St. Louis. I bought it for fifty cents with the intention of giving it to Ricky, but found that I couldn’t. I got a little too attached to it. Recently, it’s been making me think of this book, which I still haven’t finished since I’ve been making myself read The Remains of the Day (I have to teach it this week). But back to estate sales—I went to one last Friday. I saw the signs on my way to teach and stopped by on my way back home. It was a strange sale, nothing like the other one that I’d gone to, several years ago, in the same somewhat-uppity part of town—on lake Mendota, across from the UW campus and somewhere near a strange asylum that, rather fittingly, can easily be seen from the room where most English department functions take place. That last sale took place in an unwieldy, probably late Victorian house with servants’ staircases, a maze of cellars, a dumbwaiter, countless bedrooms, and exactly the kind of dusty, crammed attic that figures into so much fiction. I spent an hour or more wandering and bought an overpriced Matryoshka ($7). The sale last week, on the other hand, was held in an alarmingly ugly, probably mid-century house with terrible columns out front, red plush carpet and flocked damask wallpaper within. There were plenty of nice things in the house—a baby grand piano, some small and wobbly antique tables of the sort that always appeals to me (I had to restrain myself), ironstone and Delftware plates, carnival glass and depression glass. Evidently, the only recent occupant of the house was a man who favored tweed jackets and well-worn cotton buttondowns that could have passed for something out of J. Crew’s Heritage collection (if not for the vague scent of mothballs). I always gravitate towards the linens in any estate sale—small wonder that I have three cedar chests full of them in my small house—but the linens in this house were odd. Odd because they were all the same—cupboards full of twin, full, and king bedding, all of it exactly the same. Blue Pendleton blankets bound with satin (just like the ones that my Dad has kept for a half-century or so) and plain white flat sheets, no fitted sheets. Plain white pillowcases—a thread-count neither luxurious nor scant. Perhaps there’s something appealing in the minimalism of this standard-issue bedding, but I can’t imagine living with it. There was a singular pair of white eyelet pillowcases—where did that touch of femininity, so absent everywhere else, come from? Or else: where did it go in all the other rooms? I didn’t buy anything. I’m reading about tea services, rag rugs, and Windsor chairs. 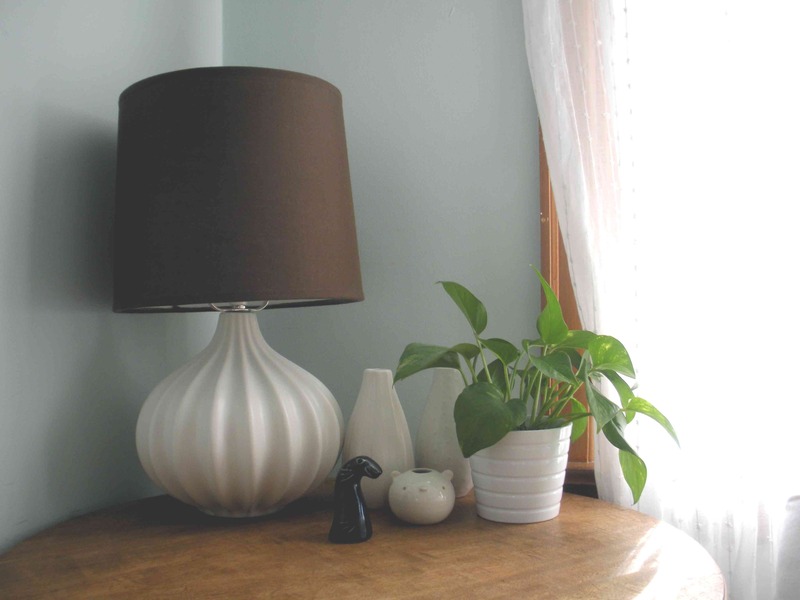 I used to have three Ikea vases like the two in the picture above; Keats broke the other one. I used to have two white Walmart lamps like this one; I broke it by catching the cord the broom handle but like to blame in on the cats.